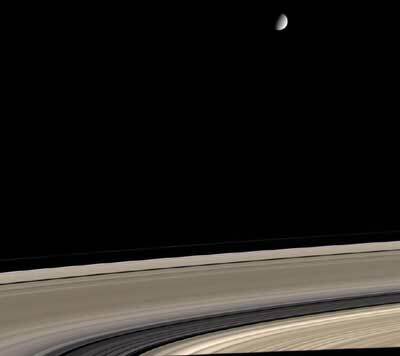 Saturn above the planet rings - Solar System Planets And Moons Section. Saturn's above the planet's sweeping rings. Saturn's icy Moon Enceladus above the planet's sweeping rings. Solar Astronomers Getting Better at Predicting Solar Wind . Researchers have discovered that the structure of the Sun's lower atmosphere, or chromosphere, can be used to predict the speed and intensity of solar winds - the stream of electrified gas constantly blowing off the Sun. This was unexpected, because the solar wind comes from the corona, or outer layer, while the chromosphere is much deeper into the Sun. By learning how to predict the strength and speed of the solar wind, scientists will be able to protect electrical equipment, satellites and space explorers. Cassini recently took this image of Saturn's icy Moon Enceladus above the planet's sweeping rings. Although the rings are made largely of ice, they've become dirty because of contamination from meteoritic dust gathered over hundreds of millions of years. Enceladus, on the other hand, looks comparatively pristine. There must be some process that continues to resurface Enceladus, to keep it from turning the same dusty colour.